According to Google trends, interest in the search term 'vegan' has doubled in the last 12 months alone having already quadrupled in the previous 4 years. VegfestUK exhibitions and festivals are seeing record crowds even though many other vegan festivals and shows are popping up in cities all over the UK and Ireland. Interest in vegan food, clothing, cosmetics and fashion as well as vegan politics has never been so high. 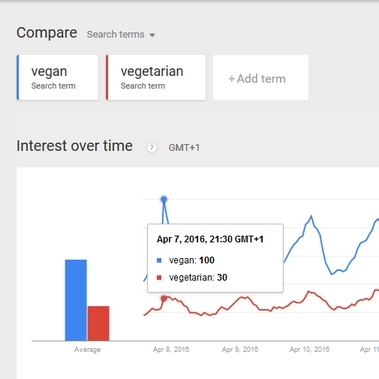 Similar vegan trends are being seen all over the world, not just Europe and the USA. 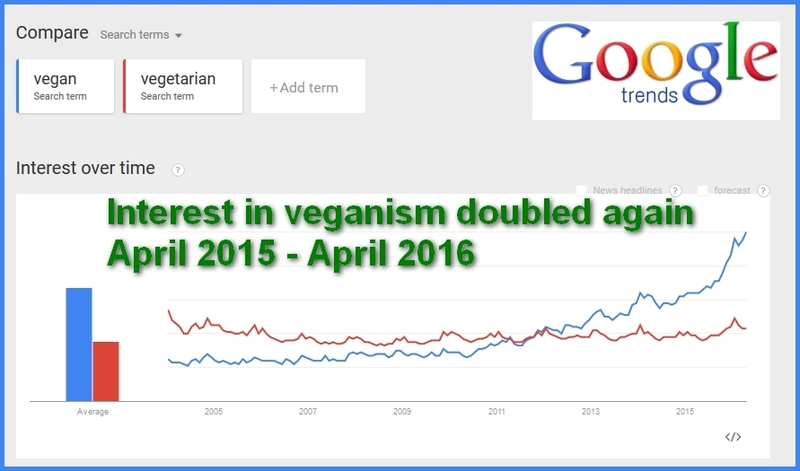 Interest in veganism is now running at nearly three times than of the search term 'vegetarian' . All restaurants need to re think their menus as a vegetarian lasagne just doesn't cut it anymore. Just substituting the meat for a bit of Feta, Goats cheese or Haloumi is ..Yawn, just, Yawn, too lazy. 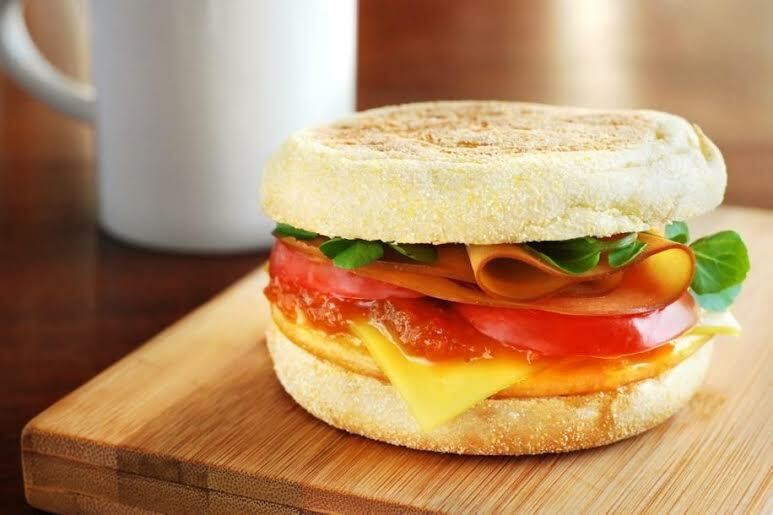 Eating out has never been easier with a number of Restaurant chains introducing new vegan menus. Pizza Express has had a Vegan Pizza for some time but now Zizzis has launched a Vegan Pizza with Dairy Free Cheese which has left Domino's missing the boat on their chance to introduce the vegan pizza that they sell in Israel to UK high streets. A string of household mainstream brands have announced their intention to bring out vegan versions of their most popular products, even Ben and Jerry's Ice Cream and Guinness. Scientists have discovered and isolated the distinctive taste of red meat is from haem iron that they have replicated from iron rich plants. Soon you will be able to buy a veggie burger that not just tastes like but bleeds like a piece of an animal flesh. What excuses then for encouraging and sustaining the torture of animals with your shopping budget? 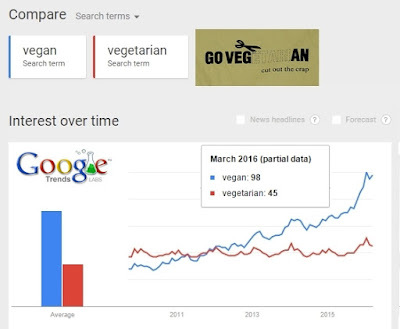 It's never been so easy to be vegan and more and more people are running out of excuses to stop increasing the risk to their health and the health of the planet as well as the inexcusable cruelty and death to millions of animals. What excuses are there left for not going vegan? Reacting to news that the UK Government is now considering extending the ban on smoking in cars with passengers under 18 (to include processed meat products for Stoptober 2016), Starbucks have revealed their intention to be 100% vegan by the end of the 2016. This also supports NHS efforts to encourage people to eat at least 5 a day portions of fruit and vegetables following revision of ‘The Eatwell Plate’ and Dietitians recommendations on cutting back on meat to no more than twice a week. Starbucks UK is apparently nervous that if the meat free Stoptober plans go ahead one of their customers could be prosecuted for consuming a Starbucks processed meat product in their car just because they like carcinogenic food and they have a child passenger. This would be a PR nightmare and these days with all the mobile phones and in-car videos it’s only a matter of time before someone is captured risking their life and a huge fine by eating a processed meat product with Starbucks branding.